The rights were acquired and an edited, but still over-long, version of Priestley’s unmade film script went into production as part of Out of the Unknown’s second series. 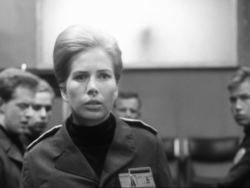 Although every other instalment was limited to fifty minutes, a special case was made for Level Seven and it was allowed to run to an hour.5 The script eschewed the novel’s diary format and introduced the character of the General to give a human face to the otherwise unseen controlling authority behind Level 7. 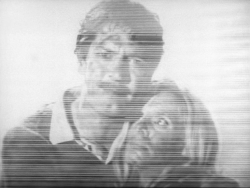 To be more appropriate to a visual medium, the radio broadcasts of the couple reporting from the devastated surface became a television transmission. Priestley also introduced the setting of the hydroponics room, which became a key location for several scenes in his play, notably the conclusion. This was perhaps wise as it created a distinctive setting, preventing all the action occurring in otherwise similar sets. The script was eventually assigned to Rudolph Cartier to direct, after Shubik’s earlier choices of Ronald Eyre and Charles Jarrott proved, respectively, not interested and not available.6 Cartier had experience with science fiction and grim futuristic visions. Between 1953 and 1959 he had produced the BBC’s three groundbreaking Quatermass serials and in 1954 was responsible for the controversial dramatisation of Orwell’s Nineteen Eighty-Four. Cartier gave the script the strong production it demanded, and no punches were pulled in its grim conclusion. Cleverly, the production maintained the novel’s ambiguity over the identities of the warring nations, with the large map, on which the progressive destruction of the world is charted, consisting of abstract shapes and markings rather than identifiable countries. Costumes were similarly ambiguous, with the military uniforms not clearly styled on the forces of any one particular nation. After its initial BBC2 transmission in October 1966, television critics were unanimous in their praise. “A terrifying bit of science fiction, as precisely shaped by Priestly as, in performance, it was manoeuvred by the director, Rudolph Cartier, and acted by [its] cast”, wrote JC Trewin in The Listener, who added that “the tension was inescapable, the excitement incontestable”.7 The Guardian admired the play’s “extraordinarily sound structure and steady balance of interest and tension”, as well as its “well chosen cast” and “intelligent direction”.8 One viewer wrote to the Radio Times that Level Seven was one of the best instalments of Out of the Unknown, finding that “the settings and photography were perfect.”9 It was repeated on BBC1 in 1967, along with five other highlights of Out of the Unknown’s second series. 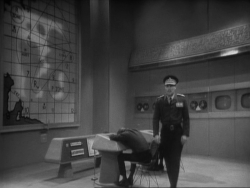 As was standard practice in the 1960s, the master videotape of Level Seven was wiped for re-use once it had been telerecorded to film for overseas sales. Like the bulk of Out of the Unknown, and so many other programmes, these prints were subsequently ‘junked’ once it was felt they had no further commercial potential, leaving no recordings for posterity. Consequently Level Seven was for some years regarded as Out of the Unknown’s missing masterpiece and unsubstantiated rumours persisted that a copy existed in private hands. Happily, a 16mm film print of the play was discovered in the archives of German television broadcaster Radio Brennen and returned to the BBC in early 2006. Originally posted: 30 October 2012. 4 July 2013: Added Radio Times reference. 24 November 2014: Added images. 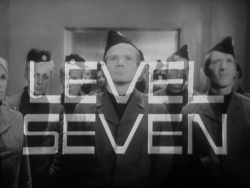 ‘Level Seven’ was released on DVD by the BFI as part of the Out of the Unknown release on 24 November 2014.